Where can I sleep with my RV in Canada? Where can I sleep with my RV? 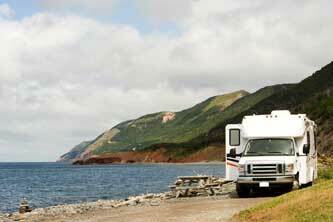 In Canada, campgrounds are the only places where you can legally park your RV for the night. Spending the night at rest stops and shopping malls is strictly prohibited. That is why it is important to carefully plan your Canadian RV holiday. There are thousands of campgrounds across Canada. To book a camping site, you will need to know the length of your vehicle and the number of passengers. Make sure that the campgrounds you choose accept RVs. Your camping site will cost $40 to $90 per night, depending on the season, the destination and the number of services. Rest stops are located along major highways. They are identified by the sign on the right. It is strictly prohibited to spend the night at a rest stop. The maximum stay permitted is four hours. You may decide to risk it, but there is a good chance that you will be woken in the middle of the night and asked to leave the premises. Note that it is prohibited to spend the night in a shopping centre parking lot in Canada. The exception to this rule is Walmart, which permits RV parking on its store lots where possible. Be sure to ask the store manager's permission before settling in for the night. Where can I park in the city? Do I need to rent a child's car seat? Do I have to book my campgrounds ahead of time? What is the fuel consumption of an RV?